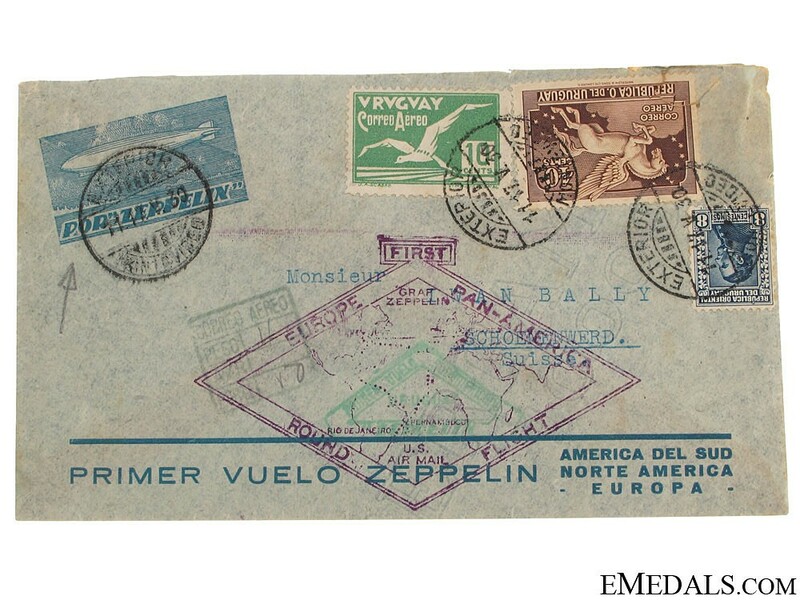 LZ 127 Graf Zeppelin Air Mail Envelope 1930 - Bluish air mail stock envelope, stamped "GRAF ZEPPELIN EUROPE PAN-AMERICA ROUND FLIGHT" and illustrating a map of North and South America, Europe and Africa and the various stops around the Atlantic, postmarked May 17, 1930 at Montevideo, Uruguay, stamped printed "POR ZEPPELIN" insignia, three Uruguayan stamps, addressed to "Monsieur IWAN BALLY, SCHOENENWERD, Suisse" (Switzerland), 90 mm x 154 mm, extremely fine. Footnote: LZ 127 Graf Zeppelin was a German-built and -operated, passenger-carrying, hydrogen-filled, rigis airship which operated commercially from 1928 to 1937. It was named after the German pioneer of airships, Ferdinand von Zeppelin, who was a "Graf" or Count in the German nobility. During its operating life, the airship made 590 flights covering more than a million miles (1.6 million km). It was designed to be operated by a crew of 36 officers and men. In May, 1930 the LZ 127 made its first visit to South America as part of a triangular flight between Spain, Brazil, and the United States. Providing passenger, express freight, and air mail service between Germany, Spain and South America was one function which was an early consideration in the design of LZ-127. It was intended in 1928 to offer passage between Friedrichshafen, Germany, and Rio de Janeiro, Brazil, for 1,500 RM ($356). The 1930 flight originated in Friedrichshafen on May 18 and stopped first in Seville before leaving Europe. The Graf arrived in Brazil first at Recife (Pernambuco) docking at Campo do Jiquiá on May 22 where it was greeted by a crowd of more than 15,000 before preceding on to Rio de Janeiro. The airship then flew back north to Lakehurst, Nne Jersey before heading east over the Atlantic on June 2 to return to Germany with another stop in Seville. This flight led to the establishment two years later of the Graf's regularly scheduled commercial passenger, mail, and freight service between Germany and Brazil which operated from 1932 to May 1937. 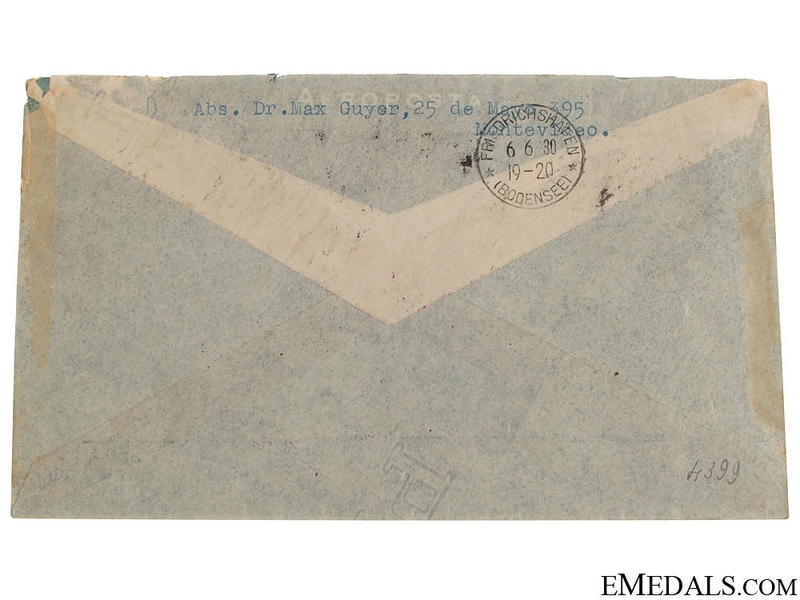 As with so many of its major journeys, the Europe-Pan American flight was largely funded by souvenir mails franked with special stamps issued by Spain, Brazil, and the United States good only for franking mails carried on one or more legs of the trip. The US issued stamps in three denominations: 65¢ (C-13: 1,135,000 printed; approx 20,000 sold/distributed), $1.30 (C-14: 1,005,000; 30,000), and $2.60 (C-14: 1.070.000; 5,000) all three of which were issued on April 19, 1930. With the US already in the depths of the Great Depression, however, only about 7% of the very expensive stamps that had been produced had been distributed when the issue was withdrawn from sale on June 30. The more than three million unsold stamps were promptly destroyed by the Post Office thus making the three Graf Zeppelin issues by far the USPOD's smallest of the 20th Century. Despite the poor sales of these issues, the Post Office Department nevertheless paid the Zeppelin Company $100,000 for the carriage of US franked mails on the flight.